Business and Professional Women of Southern Ocean County (“BPWSOC”) invites you to a Halloween Psychic Fair Fundraiser on Friday, October 26, 2018 from 6:00 p.m.-10:00 p.m at Captain's Inn, 304 E Lacey Road Forked River, NJ. There will be light snacks, vendor tables and a costume contest. The six psychics feature Kasandra (Crystal, Palm or Tarot), Harold, Carol, Marie, Joanne (Medium) from Charmed in Company and Tommy (Tarot/Angel Cards). 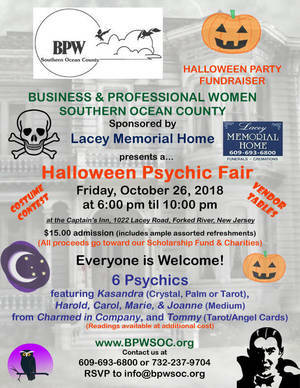 A reservation can be made via email at info@BPWSOC.org, our webpage at www.BPWSOC.org and Events where you can pay via the Donate button or checks can be made payable to BPWSOC and mailed to P.O. Box 722, Barnegat, NJ 08005.The cost is $15.00 for admission and readings available at additional cost.